Massive set of results, in more ways than one! Whilst probably being the longest set of results email it’s undoubtedly the most successful one too. It was the Thurstaston Multi-terrain Tuesday 13th May and a gorgeous night too. Check out the sunset photos below! Jayne Joy continued her great form with first in for Helsby and first lady overall breezing round the course for 15th position. It is also an honour and fantastic news that the Helsby legend Paul Frodsham is back in the green vest. Well done to the five who ran and to Mario and Joe for support on the course. Also on Tuesday was the Wavertree Mystery 5k where Colin and Tom ran and both secured PB’s. 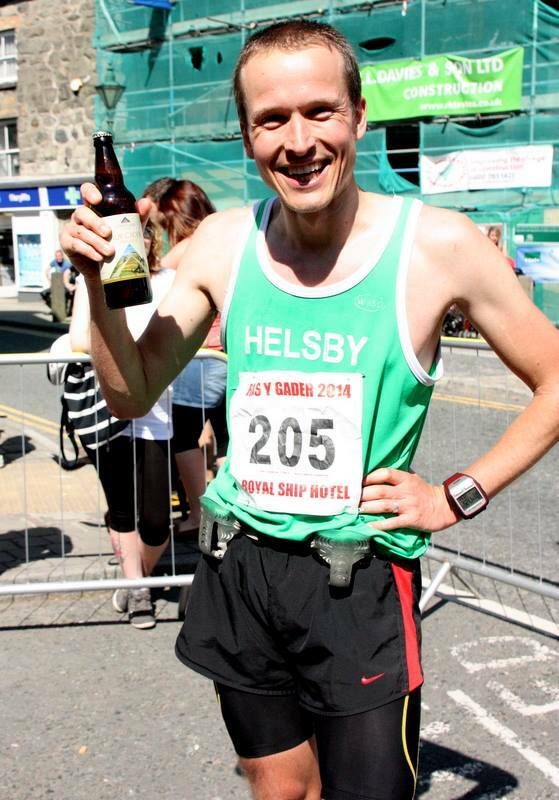 How good is Helsby running club at the moment! Not to be outdone for a Tuesday night midweek sports special Andy Smith did the Moorclose 10k in Cumbria. Race report from Andy below. “Tuesday night was the Moorclose 10km race in West Cumbria. Local whispers had that it was a fast course, although looking at the 100ft lump negotiated twice on the out and back course led me to suspect that this was going to be only relatively fast for the area. Still, it was a nice evening and hot on the heels of my parkrun debut at the weekend sounded like a good idea. The course was along a tarmaced cycle path following one of the many disused railway tracks which cris-cross this former mining district. The first 3k went gently and continuously uphill, followed by a fast 2k descent to the turn. Then back up what was now a 2k climb, waving to all the runners still on their way out before the final 3k descent back to the finish. It was 62nd Delamere Park Run 5k on Saturday 17th with Colin Bishop in a good race with some strong opposition. First male in for Helsby was Colinfor 4th place and first female was Janet Robertson 38th overall. Colin Thompson had a winning run over at the Warrington Park Run 5k for a new course PB. Also on Saturday we go from 5k’s to the Apocalypse 50 Ultra in Shropshire where Gareth Boyd and Chris Fitzpatrick took on the beauty of the Shropshire hills. Race report from Chris below. “We travelled down on the Friday evening to Carding Mill Valley in Shropshire, for a 9am start the next morning, little did we know we know we would be running to around 11pm that night, after setting ourselves a target time of around 12 hours ish! Right from the off it was a hard slog up a 1500ft ascent, and it hit home quickly how tough this event and how big some of these hills were going to be, but they were worth it, I cannot describe the views on show, they were spectacular looking over the Shropshire skyline. It was a cracking day to go out running but maybe a little too hot for a 50 mile ultra, but the checkpoints were well stocked and lots of friendly faces out on the course, great camaraderie between competitors and the miles were starting to get ticked off slowly but surely. We had our drop bags with lots of goodies in at mile 30 and got to the pub only taking 1 slightly wrong turn, the next 10 went brilliantly and we felt really strong coming out of the 40 mile checkpoint, were it went all a bit wrong. We turned off just for a few moments and followed the 100 mile runners instead of going a different direction with the 50 milers, once we realised our mistake we backtracked and got back on course, and it started to go dark, we bumped into a lovely lady called Fiona, who knew her arse from her elbow unlike myself and Gareth and we agreed to run the last part together, but whilst it was pitch black, and talking about park runs, we missed a vital turning and ended up getting lost again, which to be honest is a little scary at that time of night, however we back tracked again, made the right turning and managed to come through the finish around 14 hours, to a few people still out on the course clapping us in. Jim Jones was at the Mount Famine fell race in Hayfield, a race which has previously been a club counter for us. 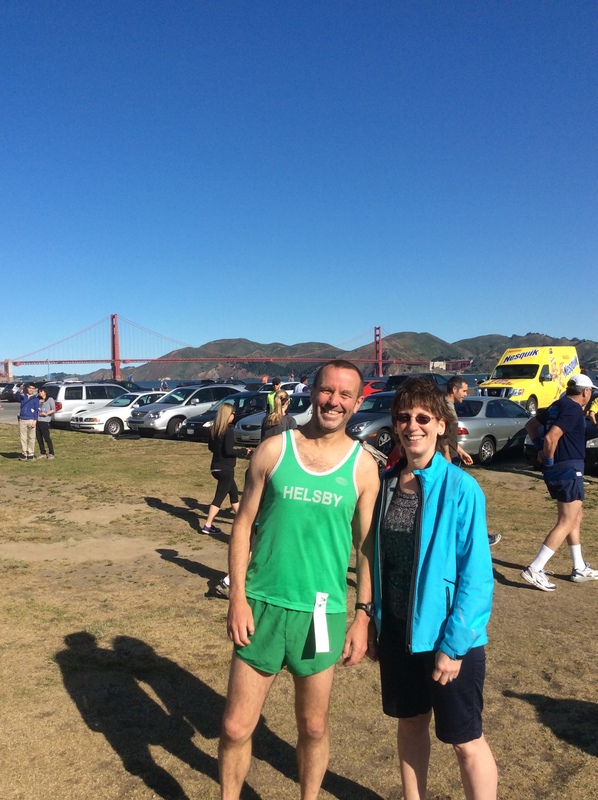 Race report from Jim below and well done. It was a bug turnout for Helsby at the Chester Half Marathon which was our 5th road club counter of the year so far. Full results can be found below but I’ve used finishing position and chip times on these results. First in for Helsby was Jim Higgins for the full 20 points followed closely by first Helsby female Alison Halsall who was also 3rd in her age cat. Great running from everyone involved. Sunday was one of our clubs much loved hill races near Trefonen, Oswestry, the Mynydd Myfyr where Joe Beswick was there to watch and Tim and Jenny Palmer had a run out. 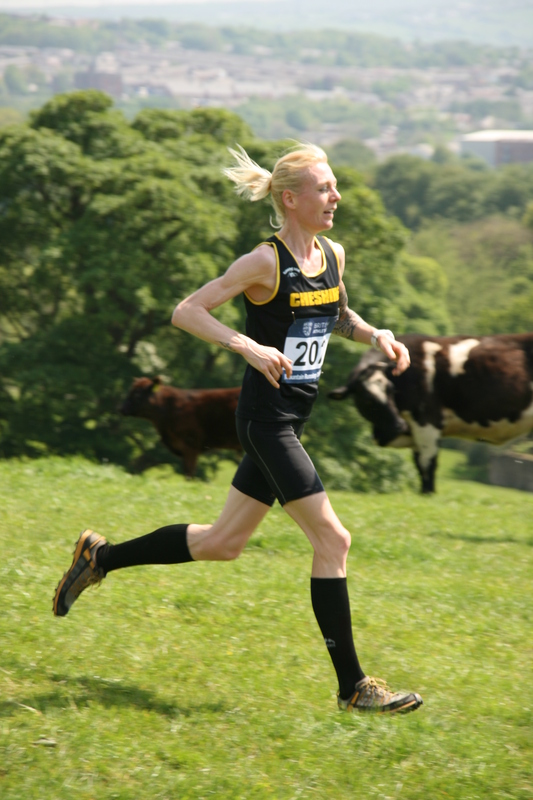 Also on Sunday 18th May I had the pleasure of witnessing an absolutely brilliant race by Jayne Joy who was representing Cheshire in the Inter-counties Fell Race at Witton Park near Blackburn. Jayne came home in a phenomenal 6th overall in a classy field in warm conditions. Make sure you get your autographs now! Jayne helped secure Cheshire 5th county overall. Buckley’s Simon Roberts has taken charge of the Hot Foot up Famau Fell Race. 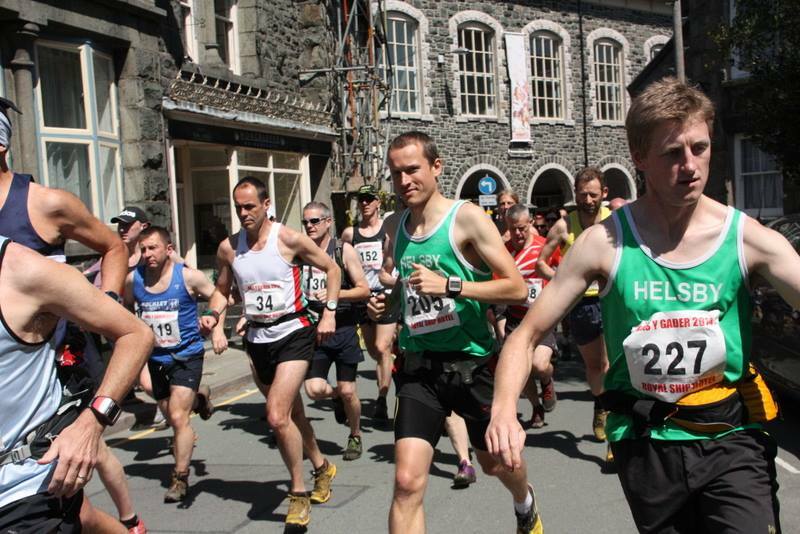 If anyone can help Simon on the night, marshal, photos, results etc then please contact Simon at simon.roberts@chester.ac.uk, This race is at Moel Famau on Wednesday 18th June.